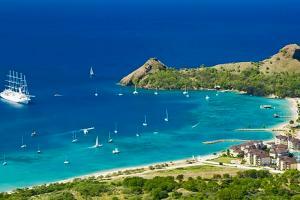 The Landings St. Lucia is a beachfront, luxury resort located on St. Lucia's most gorgeous bay. Expertly designed around water, the resort offers lavish one-, two- and three-bedroom villas in a harbor community. Enjoy first-class amenities including a 7,000 square-foot RockResorts Spa®, a Health Club, the casual, open-air setting of The Beach Club restaurant and fine dining at The Palms. A twenty-five minute drive from Vigie/George F.L. Charles Airport.